Waaaaaay back in 2000, Geof ran his very first ultra at the Minnesota Voyageur 50. Upon putting together our racing schedule for 2010, we noticed how well it fit in with our Leadville training and decided to make the trip up for it. After about a 9 hour drive up from Chicago, we arrived in lovely Carlton, MN for packet pick-up followed by a spaghetti dinner at the Cozy Cafe in downtown Carlton. When we walked into the Cafe, we were greeted by a large table of fellow runners that invited us to join them for dinner. Sounds good to me! Robert Wehner (Glacial Trails 50/50 RD), Pat Gorman, Brenda Bland and Kathy Siculan were familiar faces at the table and made us very welcome in their group and we had a great time chatting with them, thanks guys and gals! After wandering around the waterfront area of Duluth for a bit afterwards and grabbing some much needed ice cream, we headed back to our hotel to put the final touches on our drop bag which we would have waiting for us at the Fond du Lac aid station (miles 15.5 and 34.5). Lights out by 10:00. The Country Inn and Suites in South Duluth is where it's at if you're ever in the area...lovely hospitality! Walking along Lake Superior in downtown Duluth. Gorgeous, huh?! Moving on! 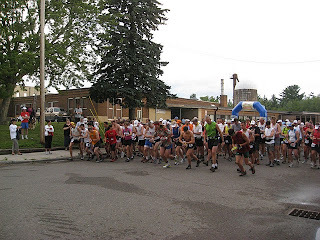 So this race was going to be a little treading of the Leadville waters to see what we each had in the tank. We decided we were going to run this one together and just enjoy the day. Voyageur is a fairly technical and challenging out-and-back course, from Carlton to Duluth and back, but I found it to be very runnable in most sections...except for the powerlines (oh good heavens, the powerlines...the pain, the suffering, oh the humanity!). But I digress. At precisely 7:00 Andy Holak, RD extraordinaire, sent us off into the warm and muggy morning, skies threatening to open up on us. 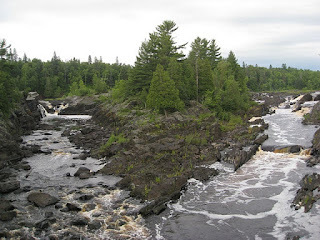 This was my very first visit to Minnesota, so this run was going to give me a good tour of what it has to offer. It is gorgeous! The first 1/2 mile or so heads up a paved bike path before turning onto the Carlton Trail which was going to be a fast introduction to technical trail running for anyone who hadn't done it before. Thankfully, I remembered to put on my agility hat that day and managed to navigate the tricky terrain with no problems. In fact, I managed to stay vertical the whole race, imagine that! We stayed on the Carlton Trail for about 3.5 miles. The terrain is very rocky and rooty, and follows along a rushing river. The trail was lush and green and muddy in spots due to recent rains, and got even muddier after it rained later in the race. Eventually, we got to the Swinging Bridge which literally swung as you ran across it, kind of unsettling at first. The first aid station was right after the bridge, but since we planned ahead and prepared ourselves 4-hour bottles of Perpetuem we didn't need anything so kept on going across the parking lot and back onto another trail. We were moving good and I felt amazing. My feet were happy, my legs were happy, my head was in the right place and things were just clicking. Since much of the trail is single track, I took a spot behind Geof and kept my eyes focused on his feet. It's hypnotizing and gets me into a really good rhythm for some reason. His feet are magic :) We walked big hills and ran everything else. I was very quickly thankful for all the calf endurance exercises I've been working on, in addition to the gazillion planks and decline squats I do most days! We noticed others getting off course pretty easily, despite the really well marked course. There are a number of intersections, though, where, if you're not looking up, it's easy to get off course. I think technical courses need to mark the trail down low since runners are looking down most of the time in order to negotiate terrain. Some food for thought. There are a number of stream crossings in this race, but with some snazzy footwork and balance you can pretty much avoid getting your feet wet. Just after the 10.5 mile aid station you enter the portion of the course called powerlines, named for the...powerlines...that you follow along it :) Holy EFF! Those things are steeeeeeeep! I guess it was good training for Hope Pass and Sugarloaf Pass, though. Geof described the powerlines section perfectly later on: "if you stood straight and reached out two feet in front of you without bending over, you'd touch the hill we had to run, it was that steep." I don't know how long this section was, but there were more than a handful of these 300 ft. climbs and descents up narrow and slippery trail. Some portions were so steep going up that I was grabbing branches and plants alongside the trail to keep from tipping backwards! Then, you had to get down the backside of it. If the muddy trail had been any muddier, we could have slid down these on our butts very easily! My quads and hams held up amazingly well during the race, but now I'm feeling it. The second time over powerlines, heading back to the finish line, the sun had come out and humidity had risen considerably so getting through this section was even tougher due to the exposed climbing. Beyond the powerlines were miles and miles of glorious runnable trail, stream crossings, technical footing, steep climbs (but not as steep as powerlines! ), running across ski slopes, along quiet country roads, and through some of the greenest forest I've ever seen. The rain trickled down lightly on us from time to time, but the thick canopy of trees kept us from getting soaked. For a field of ~140 runners on an out-and-back course it sure was quiet. We could go miles before seeing anyone else. 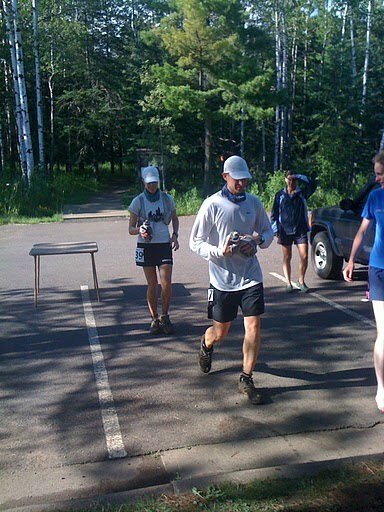 I grabbed a couple chunks of watermelon and another gel from the aid station table and we headed out. We were freakin' rockstars with these aid stations. All our stops were under one minute, generally under 30 seconds I would say, except for Fond du Lac the second time through, at mile 34.5, when we both made a sock change, which may have been close to five minutes. I liked just rolling through stations rather than lolly gagging. The way back was more uphill at first so we powerhiked it, then we got to the road and that was downhill, so we ran. Running across the ski slopes was flat, so we ran that, too. We were moving, though it felt faster than it actually was :) I gave up on any sort of PR at the turnaround, which we reached in just barely over five hours, knowing the powerlines were going to give us a run for our money, literally. So, I let myself settle into having a solid race and feeling good. I focused a lot on my form once I began to fatigue, which really set in around mile 40. I made sure my feet were under my hips, hips pitched forward, core contracted, shoulders back. Magic. Still, nothing was bothering me and I felt infinitely better than I had during our 24 mile run the weekend before. Particularly of note, my lower back never made a peep throughout this race...all those planks are paying off, no doubt! At mile 34.5, we both sat and changed into clean socks to freshen up the feet for the final 15.5 miles into Carlton. I put on a fresh pair o' Drymax Max Pros and it felt like I had new feet! We refilled our Perpetuem bottles for the third and final time and then headed back out. Shortly after this station, we managed to get off course and crossed a stream we didn't need to cross, of which I managed to plant my left foot directly into. So much for fresh, dry feet! Once we crossed I noticed there weren't any of the shocking pink ribbons on the trail, so we crossed back over and backtracked a hundred yards and found where we went wrong. Back on track and we went quietly on our way. Geof wasn't having the best day, mentally, so he was within himself and I just ran along with sunshine coming out of my every pore! But, after our second go of the powerlines, I began to get a little grumpy. Those powerlines took it out of me, but I was still happy to be done with them. The aid station informed us it was another 10.5 miles and I decided I hated hearing that. I ate more watermelon and Geof had some pop as we headed back out. We sort of switched roles here, he was the sunshiney one and I was grumpy. After a few miles of everything starting to feel achy from the pounding, and my insatiable thirst for water (despite drinking copious amounts of it all day long! ), Geof gave me a couple of ibuprofen. Oh bless it! Why didn't I do that earlier?! We got to the second to last aid station and I was sure that was the last aid station and I wanted to shout bloody murder when I was told there were still 5.5 miles to the finish (curses!). I drank a cup of defizzed Mt. Dew and downed a couple cups of ice cold water as we walked out of the station and across the road. Now I was peeved. WTF, where did my good mood go? Geof said to be patient, that the ibuprofen would kick in and then I'd feel better. Now we were back on the super-technical Carlton Trail and thank goodness I had my head and my legs back...I needed 'em! We moved swiftly and consistently, switching back and forth up front. 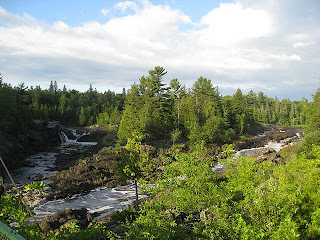 The rushing river was on our right now and we could catch short glimpses of it when the trail cleared a bit here and there. The sun had been swallowed by clouds once more and it cooled just slightly for this final stretch. We could smell the finish line and were getting stoked as we approached the end of the trail. We ran alongside this for awhile, it was just beautiful! The trail plopped us out on the paved bike path and suddenly my legs kicked into high gear. We began flying, knowing there was a little less than a mile or so to the finish line, around a bend. I was breathing heavy, but my legs felt effortless in their movement. As we neared the bend, I saw a runner up ahead, rounding the corner. I asked Geof if he could tell if it was a chick and as we got closer, saw that it was. I said something 'competitive' under my breath and then motioned to Geof to follow. We busted out and around that corner and passed the poor gal like she was just standing there. I'd like to believe there was a rush of wind as we passed her :) I felt bad doing that in the final straightaway, but I've never done that before and I couldn't pass up the chance! I always get passed like that in the final steps and this time it was my turn. And I loved it! What a rush! We crossed the line gasping for air in 11:33:29. I left it all out there in that final mile and it felt darn good. Andy came up to congratulate us and give us our custom made finisher mugs, which totally rock. We then immediately headed to the truck to grab our bags so we could shower up and eat some of the post-race lasagna dinner being served inside the finishline headquarters, Carlton High School. This was a fanTAStic race and we will be back. It was a lot tougher than Geof had remembered it being, but very true to the course description posted on the website, so I wasn't taken off guard by it. I can't believe how good I felt throughout the race, and how well everything held up. Other than the weird thirst I was having, causing me to be a little picky about what I ate or drank in the last 20ish miles, everything was spot on. This was just the confidence boost I needed for Leadville in four weeks. I finished feeling like I could have gone on...not that I necessarily felt I wanted to go on, but that I could :) That's a good feeling. Another good feeling? not having any blisters, even with high humidity! Also another good feeling? a tummy full of Wisconsin cheddar cheese popcorn and chocolate milk on the drive home after the race. Feels good to get it right. You can read Geof's account of the day here: That's A Wrap. 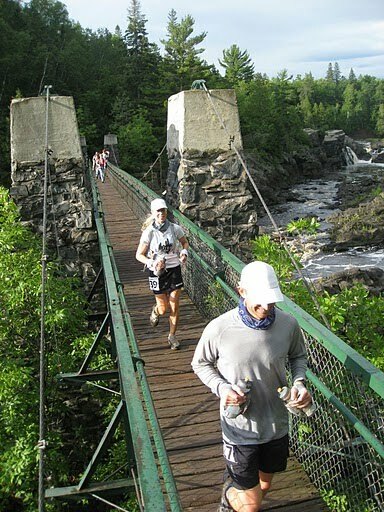 Now that you've been to Minnesota, you'll have to check out the Superior Trail Races - they're WAY more technical (but no power lines and cooler weather). Oh, you're a funny one, Steve! I'm not sure that I'm at the Superior Sawtooth level of ultrarunning just yet...but maybe one day ;-) Muhahaha! Awesome! Sounds like a great race, and you guys did it just right. Congrats! 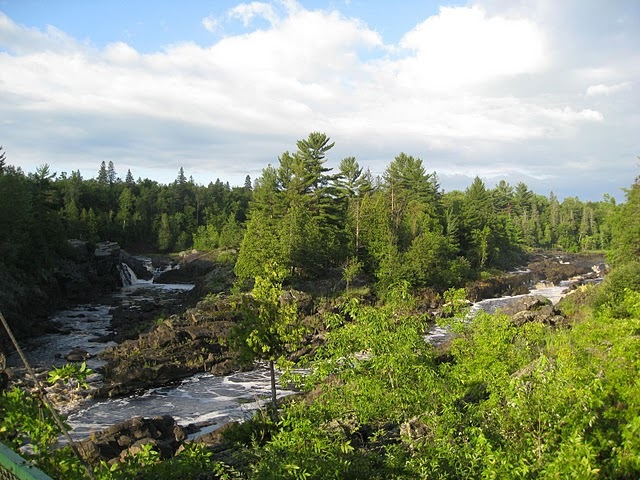 I'm headed out to Minnesota in a couple days myself and looking forward to hitting some trails Up North. You've got me totally psyched! Especially that pic of Lake Superior. I miss it! Nice job to both of you, and good luck with the rest of the training for Leadville. Sounds like you guys are on the right road! Powerlines?!?!? It's always those blasted powerlines!!! Sounds like you had a fun time. I think its awesome how you two run together during races. The two of you have had a fantastic year. Enjoy your taper (whenever you plan to start it), and I will see you two out on the trails... very soon! By the way, I also had issues with the insoles of the Wildcat. No blisters, luckily. When the shoe was wet (only when wet), then the insoles were always slipping around when bombing downhill. (do you remember my downhills?) Eventually, I just gave up and now run in the Cascadia 5. I love them (for both road and trail).